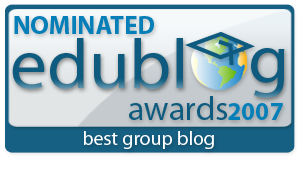 Just a quick note that our blog has been nominated for best group edublog 2007. We appreciate the recognition and your support of our project. A year ago, we set out to create a place where instructional technology theory met practical, creative ideas. Your frequent visits and thought-provoking comments are evidence that we have achieved some measure of success. Thanks for stopping by. Congratulations! You two definitely deserve the nomination and the award, too. We miss you guys! 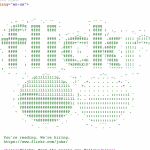 Great job – you deserve it! You guys are up to 30% in the voting, and TechLearning is down from 41% to 39%. Keep up the voting!